SoftPlanet makes it possible for everyone to get free Dropzone download directly from our servers. There is no registration needed for downloading. Dropzone is a very handy utility, designed to optimize your daily routine tasks and eliminate some of the repetitive actions. It doesn't let you define your own collection of frequently performed tasks, but also comes with a dozen of useful suggestions that you can review on its web site. Dropzone version 2.8.3 Build 745 comes with a very simple workflow. First you need to create your task collection. 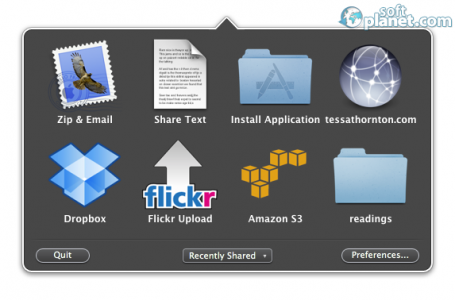 After that you simply need to drag and drop files on the particular icon in order to process them. The applications within the Dropzone interface are organized in a grid, so you can have a clearer view of them. 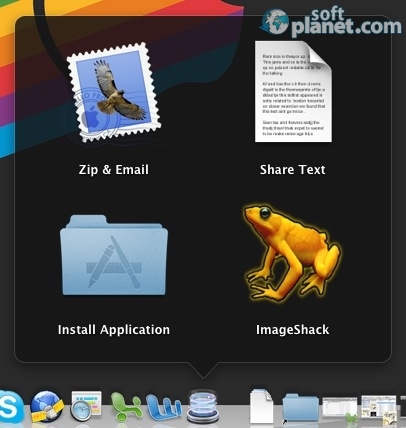 The utility can be placed within the Dock in order to have instant access to it. Dropzone 2.8.3 Build 745 is a proper software solution for Mac OS X if you perform same actions on your Mac day after day. This application can really improve your entire workflow and user experience. It is not necessary any more to waste time on some routine tasks. Dropzone allows you to go through them as quickly as possible. Our security scan shows that Dropzone is clean from viruses. The current version of Dropzone has been scanned by our system, which contains 46 different anti-virus algorithms. That ensures that Dropzone 2.8.3 Build 745 is 100% safe for your computer.